Do you need a stopper, hood or thermowell? 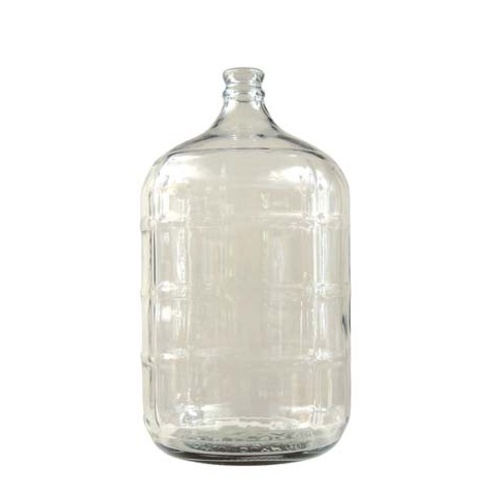 Used for fermenting, this smaller 3 gallon glass carboy is great for meads, or splitting up batches. Our glass carboy fermentors are easy to keep clean, and are made of thick, high quality lead-free glass. High quality Italian glass. This 3-gallon carboy is a great size for fermenting or lagering your smaller batches. Very reasonable shipping as well. Giving three stars as I got one awhile ago that was great, but the last one I ordered was slanted at least 15 degrees and I am ot sure that I will ever use it now. I love using these for small experimental and new batches. Then I use the 6 gal size for beers I have made previously and liked. This carboy is great for my small all grain batches. I live in an apartment and unfortunately don't have room for a full five gallon all grain system. This little gem of a carboy is the perfect size for my stove top half batches. It frees up my five gallon carboy for my extract or partial mash home brews and also stores nicely in my 5 gallon bucket fermentor. There isn't much to say about this product. It is what it says it is, and does what it's meant to do. I've been using it for my smaller batches of beer. Love it. This is my go-to for mead batches. The only issue, of course, it the potential to break it because it's glass. But, I prefer glass over plastic for the ease of cleaning and reduced risk of infection, due to scratches harboring bacteria. I wanted to start making leads. I have several different size carboys, but didn't want to tie up a larger sized carboy while waiting on the mead so I ordered this one. Perfect size for meads and it frees up my larger carboy for ales.